FUN PARTY FOOD! That’s what kid’s like. They like it fun to eat, fun to make, fun to look at. You can’t go wrong with kids, as long as it’s fun. There are just a few things to consider when planning party food for kids. 1) The age of your birthday child and his or her guests. 2) Next is the theme you have chosen. 3) Consider the time of day which will determine if you serve a full meal or snacks. Keep it simple. Don’t stress out on the menu or the preparation. As long as you have fun with it, the children will too. Why not let the birthday boy or girl take part in helping with the party food? 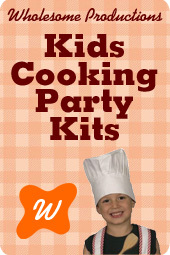 With our easy recipes and kid friendly recipes, the two of you can begin making memories before the party even begins. Consider making some things ahead of time. Cookies, dips, even the cake can be made the day before. Set plenty of time aside to bake and decorate the food so you don’t feel rushed. Store in the refrigerator or airtight containers. Healthy food can be fun too. You may want to include healthy options as well. Finger foods are great for parties. Sandwiches cut with cookie cutters are fantastic and fun as well. Fruit and veggie trays go over better than you might think especially when served with dip. Make the food even more fun by serving it up in a festive and colorful dish or check out our theme based ideas for creative food presentations. Don’t forget the drinks! We have a great selection of beverage recipes as well as cool theme based drink ideas as well. We have put together a collection of fun food that we have tested personally. As mentioned in our introduction, our family is composed of teachers, coaches, mothers, several artists and many avid party planners but did we mention we also have a professional chef in the family? He is also the father of a young son so we have got you covered on fun food for kid’s parties. Click on the links below to go to our great food.